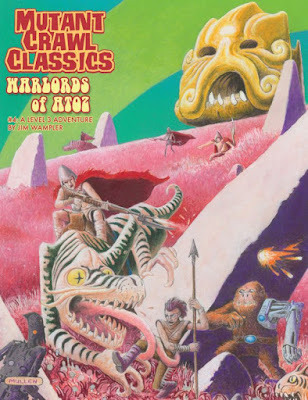 Mutant Crawl Classics #4: Warlords of ATOZ is the fourth release for Mutant Crawl Classics Roleplaying Game – Triumph & Technology Won by Mutants & Magic, the spiritual successor to Gamma World published by Goodman Games. It is the fourth adventure to be designed for use with player characters who are not Zero Level, being instead designed for player characters of Third Level. What this means is that it is not a Character Funnel, one of the features of both the Mutant Crawl Classics Roleplaying Game and the Dungeon Crawl Classics Role Playing Game it is mechanically based upon–in which initially, a player is expected to roll up three or four Level Zero characters and have them play through a generally nasty, deadly adventure, which surviving will prove a challenge. Those that do survive receive enough Experience Points to advance to First Level and gain all of the advantages of their Class. In terms of the setting, known as Terra A.D., or ‘Terra After Disaster’, this is a ‘Rite of Passage’ and in Mutants, Manimals, and Plantients, the stress of it will trigger ‘Metagenesis’, their DNA expressing itself and their mutations blossoming forth. Rather Incursion of the Ultradimension is designed for characters of Third Level, so each of the player characters will have a range of powers and abilities as equipment and artefacts scavenged after two or three adventures out in Terra A.D. Written by Jim Wampler–the author of ‘Assault on the Sky-High Tower’, the character funnel designed for Level Zero characters found in the Mutant Crawl Classics core rulebok–Warlords of ATOZ is designed to be played by between six and eight player characters of Third Level. At just twelve pages long, it is a short adventure, but one which has the potential to make profound changes to a Judge’s campaign. The set-up and the structure to Warlords of ATOZ is also very different to previous scenarios for Mutant Crawl Classics, being more of classic roleplaying adventure. In the other adventures for Mutant Crawl Classics, the adventures have strong exploratory elements to their play, the player characters searching for artefacts of the Ancients as well as overcoming whatever challenges the scenario entails. In Warlords of ATOZ, the player characters and the tribe they belong to, the Tribe of the Cog, face an encroaching threat and have essentially to perform a strike mission against this threat. The scenario opens with news of refuges fleeing from the north from a conquering horde armed with ‘magic boom sticks’, known as the Warlords of ATOZ. They have been wiping out whole villages and enslaving their inhabitants, all in the name of a surviving Ancient One whom they worship as a god. With the other Seeker groups in the tribe–Seekers being those members of the tribe who protect the tribe and go out to investigate sites of the Ancients–being busy, the player characters are tasked with assessing the nature of the threat and if necessary, impeding its progress south. What is interesting here, if not a little amusing, is that the player characters are essentially the ‘C’ team and that there are other Seeker teams in the tribe dealing with other, more pressing issues. The question is, what could those issues be and why are they so important that the ‘A’ and ‘B’ Seeker teams are dealing with them rather than the player characters? There are no answers forthcoming to this question in Warlords of ATOZ, so it will be up to the Judge to decide what they are. One thing that distinguishes Warlords of ATOZ from other scenarios for Mutant Crawl Classics, is its inspiration. As soon as I saw the artwork on the frontispiece, the inspiration was obvious, and quickly confirmed by the twin red bandoliers, red-furred cloaks, and metal helmets bearing the likeness of their god worn by the Warlords of ATOZ, and then again by later events in the scenario. Now you have to be of a certain age or you have to have a love of films of the seventies or a love of obscure Science Fiction movies to get the reference, but when you, it gives Warlords of ATOZ a certain weirdness all of its very own. Now Warlords of ATOZ does not follow through on this inspiration or its weirdness, which is a shame, but to be fair, Mutant Crawl Classics is bit more waahoo, gonzo and less adult in its tone than said inspiration. Another distinguishing factor in Warlords of ATOZ is that it does not end so much as send the player characters hurtling into another set-up. A set-up that the Judge will have to develop herself and that is the biggest problem with the scenario. It is a fun scenario, but it changes the campaign a Judge is running or sets one up whilst leaving the Judge to do all of the work. There are a few notes to help her, but if any of the scenarios published for Mutant Crawl Classics deserves a sequel, or even a campaign, it is this one. Physically, Warlords of ATOZ is a slim book. It is well written, the maps are clear, but the artwork is really good. The cover has a nicely done pulp Sci-Fi sensibility, whilst it is clear that some of the artists on the internal artwork have had a lot of fun drawing from the scenario’s inspiration. Just like the Dungeon Crawl Classics Role Playing Game, the Mutant Crawl Classics Roleplaying Game has its appendix of inspiration, in this case, ‘Appendix M’. Warlords of ATOZ is definitely drawing upon ‘Appendix M’ more than any other scenario published to date for Mutant Crawl Classics and is a rather knowing ‘wink and a nod’ to said inspiration. 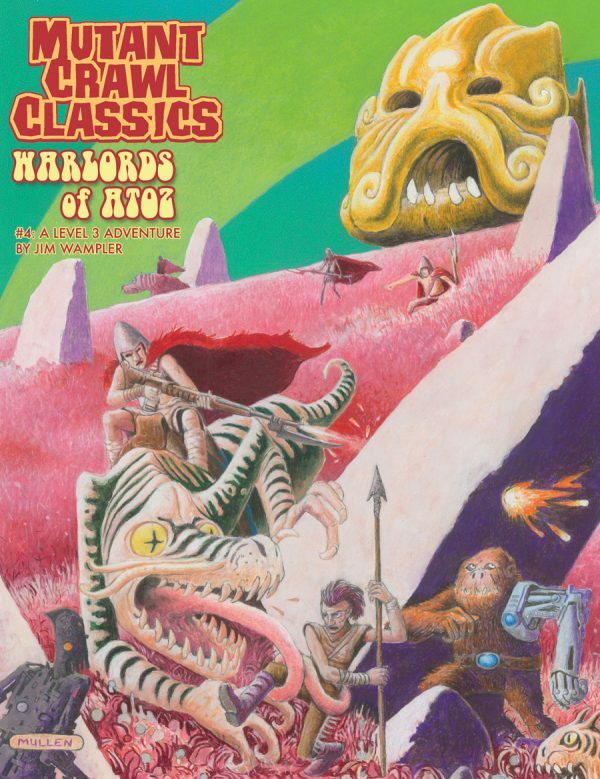 Intense fun, a decent challenge for characters of Third Level, but all too short, Mutant Crawl Classics #4: Warlords of ATOZ deserves a sequel, if not a short campaign, devoted to dealing with the threat it introduces and leaves undeveloped.